You're safer on the bicycle than on the sofa!" Lack of daily exercise is harmful to your health, while physical activity keeps your body healthy. Cycling extends your life - daily excercise for minimum 30 minutes extends your life with up to five years." Not a campaign from the Traffic Dept. but rather the public health dept. "With these posters Public Health Copenhagen hopes to place focus on the fact that there are very good reasons to ride a bicycle each day and we would like to highlight that Copenhageners already cycle 1.2 million km each day." Appropriate message in a city saturated with cycling. In Emerging Bicycle Cultures, it is always better to highlight the basic facts that appeal to homo sapiens, like A2Bism and quicker transport through our cities. 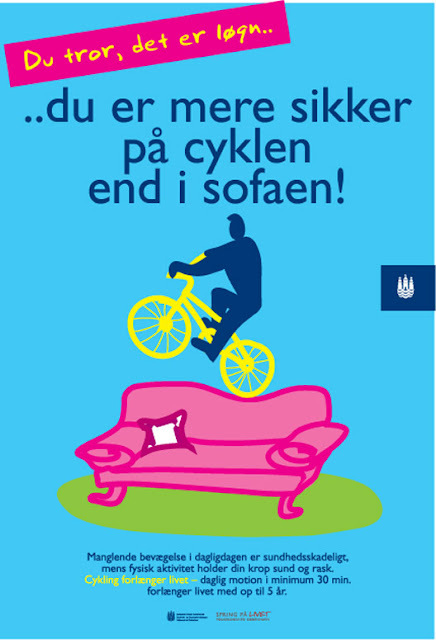 With all that said, this is an important poster in that finally SOMEONE is countering all the negative branding that cycling is suffering here in Denmark, thanks to campaigns and media coverage instigated by the Road Safety Council and the Danish Cyclists Federation.